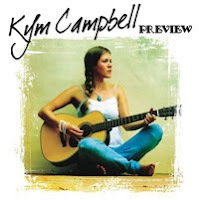 THISisMODERN.net: CD REVIEW: Kym Campbell "Preview"
CD REVIEW: Kym Campbell "Preview"
Kym Campbell comes to us from Australia, by way of Seattle, with her second release. This new collection is a 5 song EP that features her signature acoustic surf rock style. She has been referred to as the female Jack Johnson, but in actuality is a bit more lively than Jack's acoustic strummy stuff. Tristan Prettyman and Colbie Caillat are more like Campbell, except that Kym is much more mellow than both. Regardless of who she sounds like and who her influences are, Kym Campbell has put together 5 incredible new songs that are feel good acoustic pop music. The title track is a definite shining star and she puts emotion and sincerity in every bit of her lyrics throughout the entire disc. Kym Campbell may not be known stateside but rest assured that if she continues to make music like this, she is sure to join the aforementioned musicians as an accomplished and influential surf folk superstar.